UPDATE: See the below comments from Joe about who the mega-yacht belongs to! Thanks Joe! A really really really nice yacht with a really really really nice helicopter on it is hanging out just south of the Venice Pier. It has flashing purple lights and was so close to shore someone called LAPD today thinking it was going to wash ashore under duress. Fortunately, it was just sitting there being extremely expensive and cool. 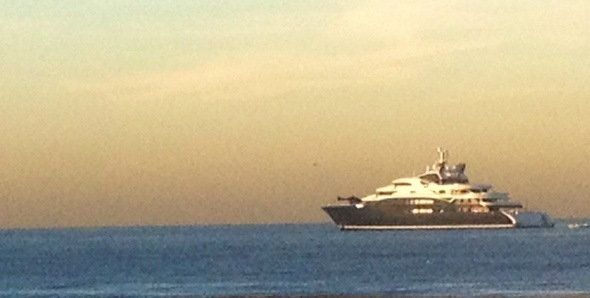 The City of LA should take lesson from this guy when buying their next yacht with taxpayer money. It looks like the serene, 440-foot megayacht, one of the 10 biggest in the world. in the Port of Los Angeles cruise terminal (yes it’s that big). and has 7 decks. And yes, you and I will never be able to afford it.